I predict a future cult classic. Move over Mint Candy Apple, there's a new kid in town..
Swan Street is a brightened iced mint. 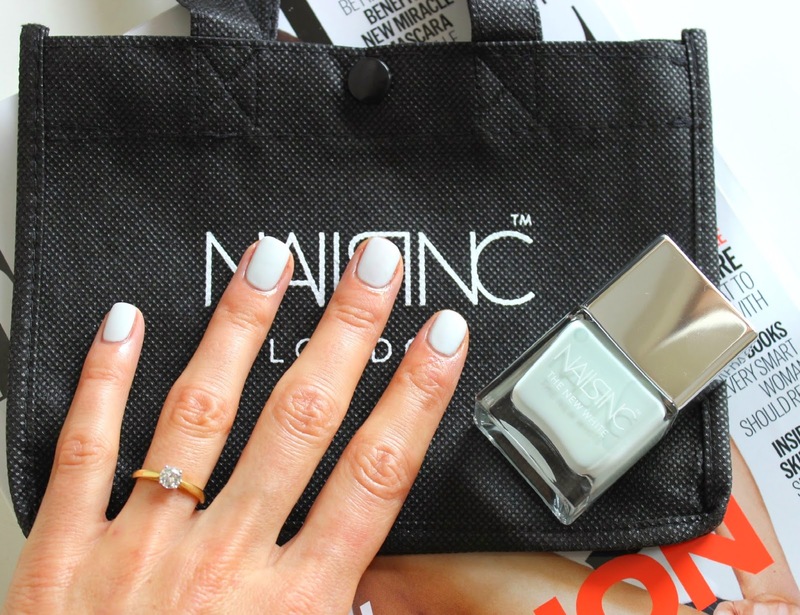 One fourth of the New Whites collection - white based polishes with a cool colour twist. Frankly they're all gorgeous and yes, I WANT THEM ALL, but for me, Swan Street is the stand out shade. It's white without looking like a tip-ex nail with a very subtle, yet very striking minty blue shade running through it. It has a real illuminating effect, we're talking complete stand out nails and even though I'm a bit pasty right now, it hasn't washed me out... But I can only imagine how much better it will look partnered with a tan. I love the new bottles and with the new bottles comes a new and improved flattened brush that makes application fool-proof... or so the manicurist tells me. A Nails Inc manicure costs £18, but if you buy any polish you get the manicure for £10, so I decided to treat myself. I'm a tough customer because I'm pretty good at doing my own nails but she did a fabulous job and encouraged me to go square, which i haven't done for ages but completely LOVE. It suits the shade too - cool, funky, fresh. I was surprised that the shade was completely opaque after two coats and streak free. £14 might be a bit pricey for one nail polish, but this one's worth it. Swan Street's going to be my go-to for the summer and beyond. I love this polish, I can't stop staring at my nails! What do you think - dare to go white? Holy cow look at that colour, I definitely need to add this shade to my collection asap, luckily I have a £5 Debenhams voucher so that's gonna happen! That rock is beautiful, congratulations. I love the colour it looks so great on you! So precise! LOVE LOVE LOVE the way you paint your nails . PERF! Your nails look utterly perfect. This is such a gorgeous icy blue! I wanted Mint Candy Apple for ages but for me, it's a baby blue rather than a mint green.